Mary Chicoine ’10 is immersed in food system planning these days as a senior land use and natural resources planner for the Franklin Regional Council of Governments (FRCOG), the regional planning agency for Franklin County, MA. With a Kendall Foundation Grant, Mary has been examining what resources Franklin County farmers need to improve their farm viability and ramp up their production. As part of the same project, she is assessing the cost of in-season produce at local farmers markets and supermarkets, and will launch a public education effort on the value of buying in-season, local produce. Zooming out to the statewide level, Mary is part of a team facilitating the MA Food System Plan process, which aims to increase production of Massachusetts-grown food. The project has at its heart social and racial justice, ecological resilience and economic development through living-wage jobs. When Mary isn’t working on food system-related projects, she can sometimes be found inventorying street trees for green infrastructure projects or creating educational graphics for low impact development projects for the FRCOG. 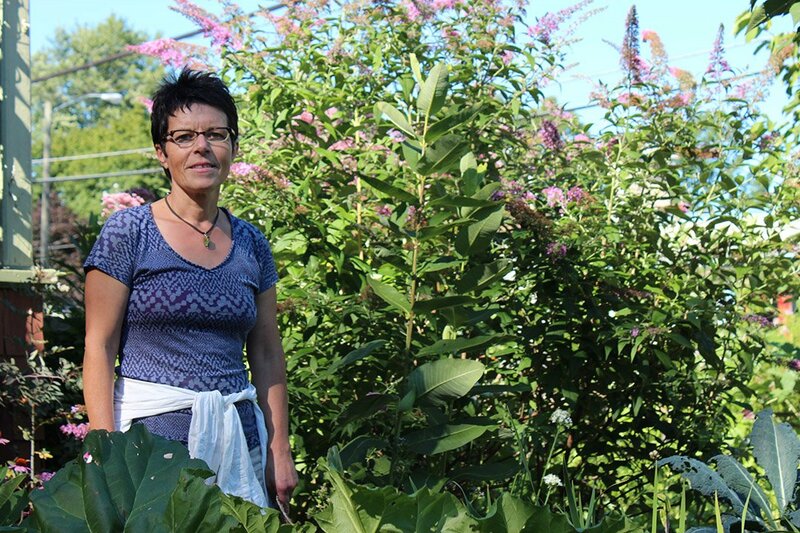 Mary Chicoine in her front yard vegetable garden, on 1/8-acre in Greenfield, Massachusetts. Mary’s sensibilities are rooted in the earth. She identifies herself as a life-long naturalist, thinking, eating and living in a close relationship with the natural world. 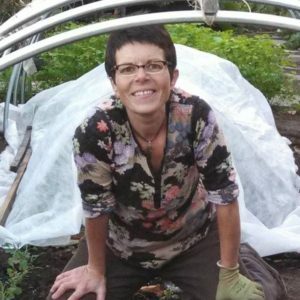 Prior to her education at the Conway School in 2010, she owned and operated Sweet Earth, a landscape design company in the Twin Cities, where she worked to connect homes and home owners to their surroundings through sound design incorporating native plantings and natural systems. Now at home in Greenfield, MA, her 0.2-acre property teems with life and provides nearly all the vegetables she and her partner eat for most of the year. Mary’s connection to the earth permeates her many other interests, including botanical drawing, seed saving, canning and preserving, hiking, kayaking, and camping. Owned and operated landscape design/build company. A desire to integrate my existing knowledge and know-how with a broader, more integrated systems-based approach to design and planning. A challenging, deep-dive, 10-month learning extravaganza. Focusing on 1) climate change resilience planning, 2) tree inventories and planting and maintenance planning, 3) vacant and abandoned building task force training 4) agricultural commission training and support 5) graphic design. I love that the work I do is nicely aligned with my interests and values. I use my graphics skills I gained at the Conway School every day in my current work. What blogs or podcasts do you recommend? Naturally Curious with Mary Holland.